Posted by C.A.R.D in Alan Cooperman, anti-Christian, Card, Christian, Christians, Citizens Against Racism and Discrimination, college, College discrimination, Discriminate, Discrimination, Gary A. Tobin, Institute for Jewish and Community Research, professor discrimination, Religion, religous discrimination, university. The other survey, by the San Francisco-based Institute for Jewish and Community Research, confirmed those findings but also found what the institute’s director and chief pollster, Gary A. Tobin, called an “explosive” statistic: 53 percent of its sample of 1,200 college and university faculty members said they have “unfavorable” feelings toward evangelical Christians. A graph accompanying the story drove the point home. By comparison, only three percent of faculty members had unfavorable feelings toward Jews. What’s funny is that the latter survey was designed to gauge anti-Semitism. The only groups with significantly negative responses were Christians and Muslims. 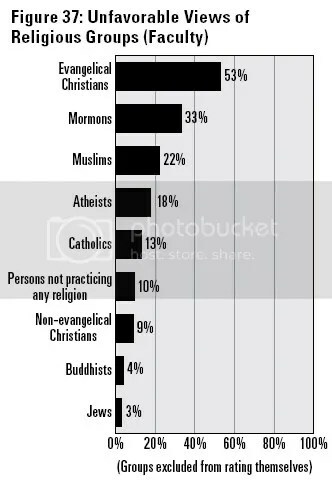 A full third of faculty had negative views toward Mormons, with 22 percent reporting unfavorable views toward Muslims, 18 percent with negative feelings toward atheists, 13 percent with negative feelings toward Roman Caholics, 10 percent with negative feelings toward the non-religious, nine percent with negative feelings toward non-evangelical Christians and four percent reporting negative views toward Buddhists.